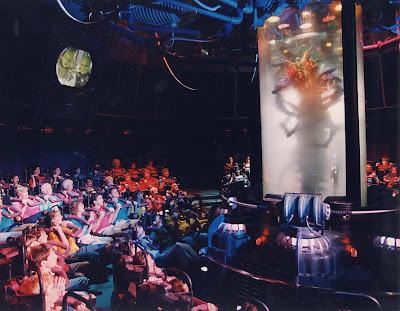 When the ExtraTERRORestrial Alien encounter open in WDW , some years ago, it was quite an event. 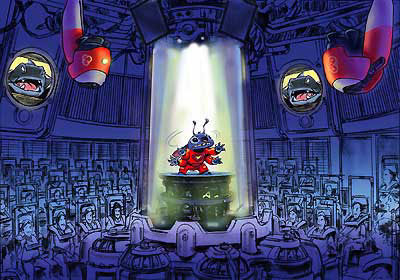 Not only it was part of a new re-themed Tomorrowland, but "Alien" was supposed to be a real frightening attraction , the first of its kind in a Magic Kingdom. Well, for the adult audience, it was really fun, and not-so-scary. But for the 12 years old young girls, the 3D sound ,the darkness and in-theatre effects were may be a little bit too scary! 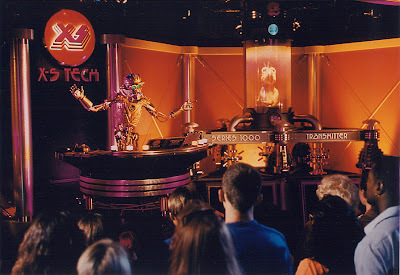 This is probably why this brand new WDI attraction - that was supposed to be built in other Disney parks - remains the only one of its kind...Mind you, still in 1994, Tim Delaney, DLP Discoveryland show producer was still expecting to built it right at the entrance of the land where the room has been kept , on the little hill on the right, between the "Constellations" shop and Autopia. 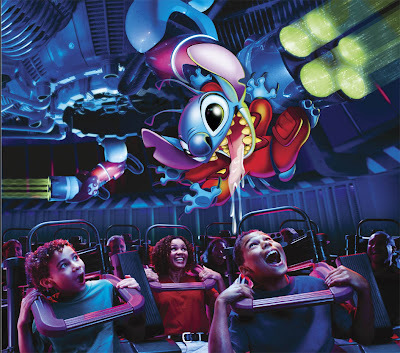 We all know what happened next: the attraction was re-themed around the Stitch character and is supposed now to be less scary than before. 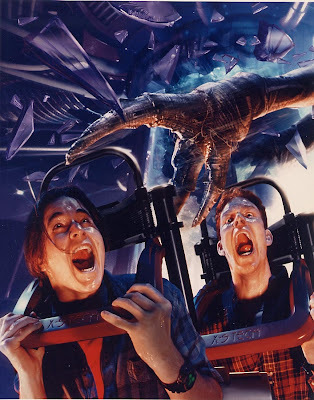 On the pictures above and below, the difference between the two pictures of the same scene is interesting: on the Alien one the boys are yelling, but on the Stitch one, the boys are younger and smiling. 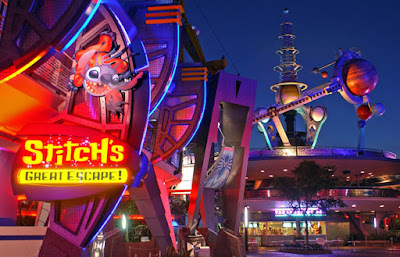 The message is clear: no need to be afraid of this attraction any more, come on in! 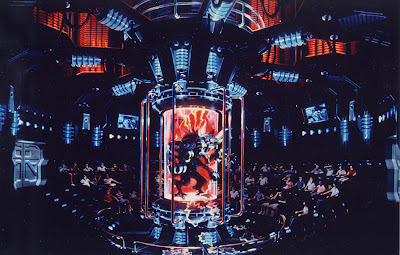 Also, note the difference between the two photos of the pre-show sequence , with the small teleportation experiment. 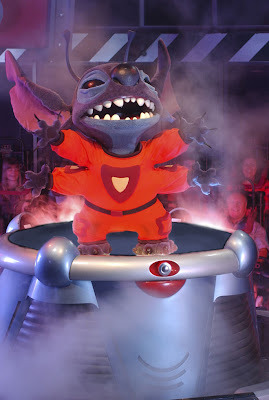 On the Stitch version, the S.I.R robot - one of the best programmed AA i ever seen - is now dressed in a more cartoonish way. 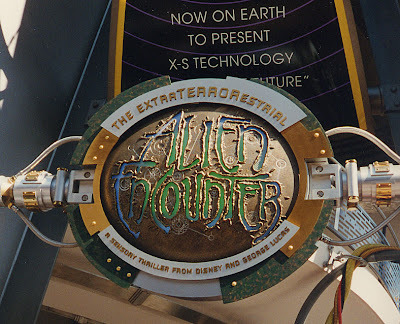 And, last but not least, you may have noticed on the Alien encounter marquee that the attraction was supposed to be a " sensory thriller from Disney AND Georges Lucas ". 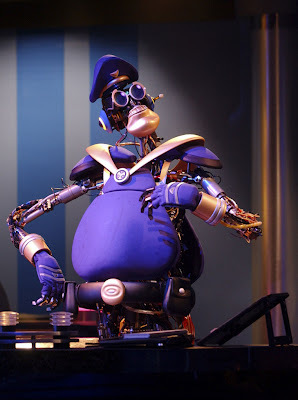 What is Georges Lucas doing in all this, you ask? 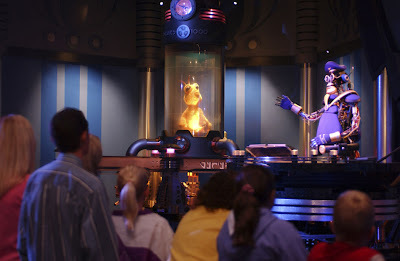 Well, apparently, and if i'm not wrong , it seems that the concept/idea of the attraction came from him during a meeting, and when Lucas have an idea, you better not forget that it came from him...which, i must agree is perfectly legitimate. 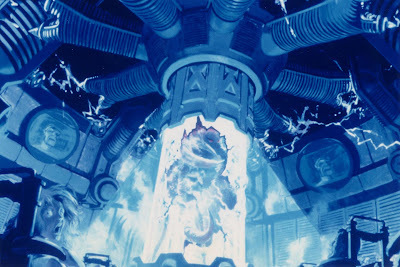 The first time I saw it, I admit that it scared the heck out of me - it was great! 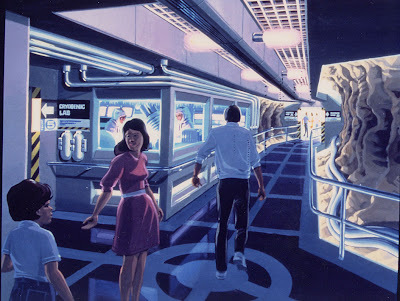 Really sad that they diluted the experience. I don't go in there anymore - it's a little boring. 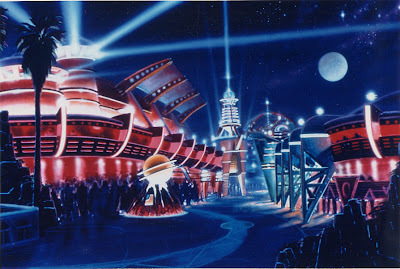 I just can't see how the experience was diluted or made boring at all. 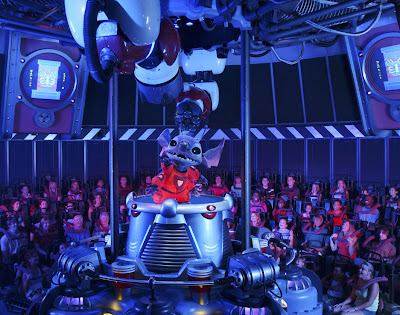 Stitch's Great Escape is a far better fit for the Magic Kingdom than Alien Encounter was. 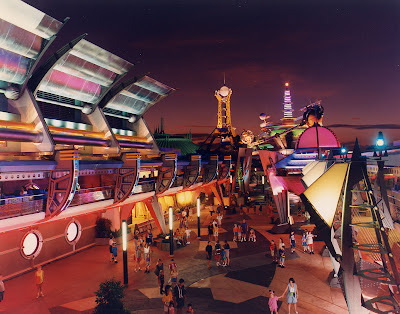 Designing a Real " Tomorrowland "